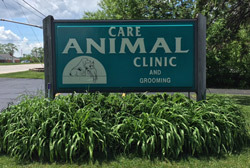 We value our clients' experience at Care Animal Clinic. If your pet or animal is currently a patient, please feel free to tell us how it went by clicking here to send in your review. We are so thankful for the care and patience provided by Care Animal Clinic. We had a very shy and fearful foster pup who could not be handled easily. The staff took at least 30 minutes out of her day to sit on the floor and slowly acclimate our pup to her touches. Most other offices I've been to have not been willing to go through the effort to make dogs comfortable like that. I would highly recommend Care Animal Clinic to anyone whether your pup is friendly or if they need a little special help like ours did. I can't begin to say how much it means to us to have the team at Care working with our animals. Since our cats passed away..., we have adopted 3 Shiba Inu from an area rescue group. All three came from puppy mills, and can be very shy around new people. The first thing the doctor does when she walks into the exam room is to get down on the floor to greet our dogs. She knows exactly how to set them at ease - she lets them approach her on their own terms and doesn't overwhelm them. She offers little treats to earn their trust. She also allows me to participate in the exam by holding and reassuring them to make the exam less stressful. I feel like she views pet parents as important collaborators. She takes her time, is very gentle, and always has time to hear my questions or concerns. I love that Care prefers a holistic approach to veterinary care - they don't just treat an illness or disease, but are focused on all aspects of our dogs' quality of life. Thank you, Care Animal for all you do for our dogs! I have nothing but praise for Care Animal Clinic and its team. We have been coming to Care since we moved to the area 7 years ago. At first my aging cat, who developed diabetes shortly after we moved to Brookfield. I love how the doctor explained not just the treatment recommended, but the reasons behind the treatment, alternatives, and is there to offer support throughout. It took us a while to find the right insulin and dose for Xela, the doctor spent lots of time with us, not just in the office, but on the phone after hours. One of Care's vet techs even served as our pet sitter when we went away, which was hugely helpful so I could rest easy that someone who knew how to administer the medication, and who could handle our sometimes finicky girl, was caring for them while we we re away. Enormous peace of mind!! We recently started to foster a dog and visited the Care Animal Clinic in Brookfield as it was recommended by our foster group. We live outside the area and had not been to this office before. We were immediately very impressed with their quality of care and attention to detail because of the way our first visit went. Our foster dog came in with a bad cough and they made sure to look over our dog outside in/near the car (so that the cough would not spread to any other pets inside the office). They also immediately cleaned up the outside area with a spray to additionally help prevent any type of cough from spreading. It is this type of forethought and attention to detail that lets me know the doctors and staff are professional and will deliver high quality care. During that visit and a few subsequent visits, we found the doctors and staff to be very knowledgeable, friendly, and professional. The doctors were very quick to respond to any questions we had over the phone. The facility is clean and appears to be maintained well. We recommend this place to anyone else looking for a good vet!